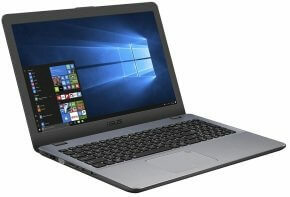 CLR are here to help you in your search for your perfect laptop replacement or upgrade with our ASUS VivoBook 15 X542UA Laptop Review and Specification article. When it comes to buying a laptop you must make the right choice. Lets do the ASUS VivoBook 15 X542UA Laptop Review and Specification. You will get all of the info that you need to make your decision, about your next buy. Stylish design and good performance. ASUS VivoBook 15 X542UA is the perfect combination that brings style and performance together. The ASUS VivoBook 15 is powered by a 7th Generation Intel® Core™ i5 or i3 processor and 4GB RAM, the X542UA is a good laptop for daily computing and entertainment. And with dual-band 802.11ac Wi-Fi, which should be the standard you look for, you’ll enjoy the most out of you internet connection. When we leave a laptop plugged in while the battery is already fully charged, it may degrade the battery. But ASUS have introduced Battery Health Charging technology that allows you to set the state of charge to 60%, 80% or 100%, prolonging battery lifespan and reducing the chance of battery swelling. It sounds good but in real life test we will have to see if it actually does what it says it can do. Now along side the Battery Health tech the ASUS VivoBook 15 also features a lithium-polymer battery. It is said that it has up to 3x the lifespan of standard lithium-ion batteries. Then you also have the ASUS fast-charge technology, that will take a low battery and charge it to 60 percent in just about 49 minutes. Now that is what we all need in our laptops.